All these years, I never got a chance to rent and drive a Hyundai vehicle on self drive basis. MYLES Bangaolore had them on offer, but I hadn't booked them even once. In June, I booked a Figo from Carzonrent for July 11-12, for 2 days for about Rs 4200. Few weeks later, I realized that Carzonrent has revised rentals downwards (Figo was costing Rs 3800+ for 2 days) to be at par with Blr and more importantly, they added more cars in Chennai- Grand i10, Amaze, Ciaz etc. I immediately cancelled by earlier booking and booked a Hyundai grand i10 for two days at Rs 4008. This post shares my quick observations on the car. 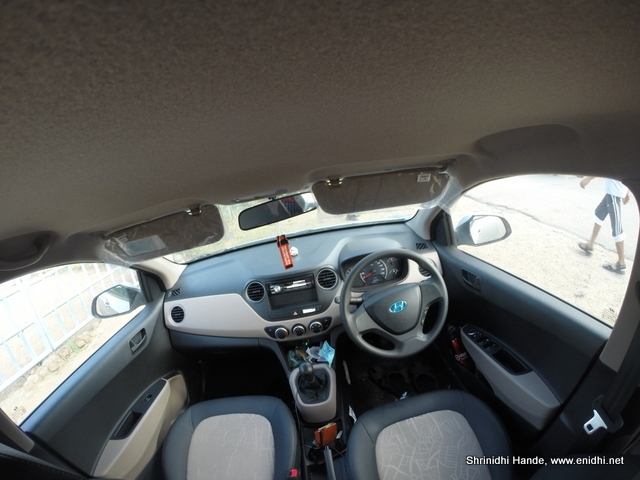 Grand i10 is less spacious than Figo and also doesn't match figo or swift in terms of engine response. While Figo or Swift can comfortably accelerate to 160 kmph, Grand i10 diesel feels more comfortable at around 140kmph. If there's more straight road and if pressed hard it takes some time and can eventually reach 158kmph where in maxes out. Swift diesel is much quicker to accelerate compared to Grand i10. I noticed that MYLES has started copying Zoomcar's idea of putting the logo on the door. Myles logo could be seen on both doors. Earlier this was not the case. Also Myles has stopped fitting video systems on the back of head rest- those systems were not serving any purpose as they couldn't recognize most of the file formats and since everyone has a smartphone or tablet, no one really needs an on board entertainment device. As earlier this was also a KA registered vehicle with TN permit. I was hoping for a bright orange coloured one (had seen one in Carzonrent Ulsoor campus), but what I got was plain silver. Also this was pretty new car with just 450kms on the odo, added to the fleet few weeks ago. On the inside, the reverse gear is stupid press a button, push down and move adjacent to first gear style. In this style of reverse you can't figure out if the car is in reverse or first by looking at the gear lever position. You should re-engage to be doubly sure or move an inch and figure out if car is moving front or back. I prefer the conventional way. Console has a gear shift adviser- tells driver to upshift or downshift if current speed is not appropriate for the gear. Console has a permanent backlight which is always ON, not just when headlights are turned ON. Also, like Figo, i10 grand doesn't get adjustable headrests for second row. Swift has it. I drove the Magna diesel variant. Guess it doesn't come with a free music system. An old style pioneer music system was awkwardly fitted in the car, but it wasn't even powering on. So couldn't enjoy any music during the drive. Magna misses out on various features like indicators on mirror, airbags etc. During the 48 hours the car was with me, drove for about 1150 kms overall. Had to put fuel worth Rs 3200. This roughly translates to a practical fuel economy of 18.5 kmpl. An incident- I was driving near Katpadi on Saturday early morning. It was raining a bit and roads were a bit watery. I was probably doing around 40-50kmph. Suddenly there was suddenly a big 'Thud' sound, whole vehicle shook a bit and then a 'Thap Thap Thap Thap Thap......" sound followed. I pulled over to inspect, noticed that front left wheel is flat. On a closer inspection, I realized that it is not just a puncture, there is a hole in the tyre and rim is also bent. Apparently some sharp and strong object like a steel rod or hard rock had made contact with the fast moving wheel and caused this damage of making a whole in the tyre and bending the rim. After replacing the tyre I went back few hundred meters to check what it was, but couldn't find anything specific. May be it flew off after impact or I missed spotting it. Thankfully rest of the vehicle was intact. There was no scratch or damage to the bumper or wheel arch or anything else. I could complete rest of the trip as planned, but without a spare wheel. Above damage can't be fixed- replacing the tyre and wheel is the only option. (Rim could be bent back to original position, but it will be unfit to support a tubeless tyre. A tube tyre can be fit on this, but may create stability issues at high speed. Rim getting damage is a very rare scenario, so Hyundai dealerships won't be stocking spare wheels and they can be had only after placing an order. Roadside auto accessories shop may not be willing to sell one single rim. They prefer you buy a whole set of alloy wheels. Reported this damage while returning the car. Looking to see how carzonrent process will work further to close this. Check this post after a week or so for possible updates. Read my previous experience of accident with carzonrent. Update: Rented a grand i10 again in 2016 March- rental amount has gone up... Experience was fine. How much were you charged to replace the rim+tyre? Even in the Volkswagan Vento have the same system as you explained need to press button on the lever and use the same for reverse or forward. True. Many cars- even Etios have that..
1) How many days did Myles take to cancel the pre-authorization of the credit card? 2) Did you pay Rs. 80 as entry tax in TN RTO checkpost? What is the maximum speed allowed in Myles? Zoom has a capping for 125 KMPH - post which they'll impose 500 rupees as penalty for the first two offences. Please shed light on this.